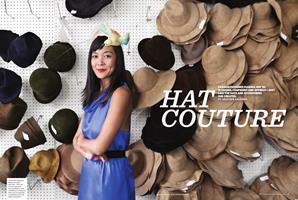 Fashion designer Eugenia Kim ’96 is daring, confident and offbeat—just like the hats and accessories she creates. Professor Roberta Stewart deploys the classics to help veterans transition back to life at home. Dewitt Jones ’65 and best friend Mele hit the surf on Papohaku Beach near his home in Molokai, Hawaii. Dartmouth may not produce many professional football players, but the National Football League is loaded with alumni talent. Engineer Anna Stork ’08 designs an inflatable lantern to aid disaster relief.